As we age, some of us will lose teeth due to disease, injury, or simple daily wear. In addition to bringing about unwanted changes to a person's facial appearance, missing teeth have a negative effect on that person’s confidence and self-esteem. With the advent of implant dentistry, however, those who are missing one, two or several teeth no longer have to accept a lifetime of embarrassment and inconvenience. Dental implants, sturdy titanium posts that are anchored directly into the jawbone and topped with realistic replacement teeth, provide the security and usability of permanently placed teeth. Dental implants are a restorative dentistry option that allows patients to replace missing teeth with ones that look, feel, and perform like their own. During the first step of this procedure, a doctor skilled in implant dentistry surgically places a titanium screw or post in the patient's jaw. After the gums have healed around the embedded post, a replacement tooth is attached to the top of it. Heavy smoking : - this slows down and hinders the healing process. Excessive alcohol intake : - disrupts healing of the gums. Periodontal gum disease : - all active gum disease must be treated prior to any implant procedure to ensure the long-term success of any treatment. Periodontal disease is a major cause of bone loss, which would hinder the success of any implant procedure. Immuno : - compromised individuals (steroids, auto-immune disease, patients undergoing radiation treatment). Teeth grinders (bruxism) : - a night-time splint can be given to treat this. Figure : - Strong, durable and natural in appearance, implants are among the most successful dental procedures performed. Today's dental implants are virtually indistinguishable from other teeth. This appearance is aided in part by the structural and functional connection between the dental implant and the living bone. 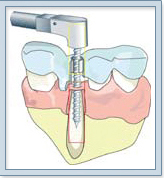 Implants are typically placed in a single sitting but require a period of osseointegration. Aside from the recovery of the actual implant itself in the early stages of the procedure, there is not a lot of recovery time associated with the dental implant procedure. There will be some soreness as the bone bonds with the titanium implant, but any discomfort can be controlled using non-prescription pain killers. After the final surgery, many people experience some mild soreness, bleeding and swelling, but these symptoms can be treated with over the counter medication as well. Most people are able to return to work the day after surgery. Your dentist will instruct you to adhere to a strict oral hygiene regimen during the healing process. Poor oral hygiene can result in swollen gum tissues and ultimately, implant failure. There is little risk associated with cosmetic dentistry and dental implants. There is a slight chance that your implant may not be incorporated into the body, and most failures happen within the first year and only in about 1% of patients. Most failed implants can be replaced by a second implant, but the success rate for tooth implants is approximately 95%.